Founder, James E. Duffy began working in the insurance business in 1943, as a 16 year-old messenger for Ohio National Life Insurance. After a stint as a Marine, he returned to Ohio National Life and began his training to become a licensed insurance agent. Shortly after, Duffy and the late Roy Grumbine started their own business in 1950. The firm became Grumbine-Duffy Inc., and in 1972 evolved into Agents Brokerage Corp. In 1981, Duffy left Agents Brokerage and relocated at 126 William Howard Taft Rd. Cincinnati, OH 45219. James E. Duffy turned to three of his sons, James C., Michael E., and Thomas P. to maintain and operate the day-to-day activities. Shortly after, the only remaining owner of Agents Brokerage Insurance, William D Carr, relocated with Duffy Agency. Thomas J. Plogsted, also joined the Duffy Agency as an independent agent in 1991. In 1998, Deborah Sandmann was employed by Duffy as receptionist and customer service representative. She obtained her property/casualty license in 1999 and in 2004 she became an independent agent. In 2006, a third generation Duffy joined the agency. Grandson Thomas C. In March 2008, Duffy Insurance Agency will be making a bold “move” and relocating the office to 7601 Cheviot Rd., Cincinnati, OH 45247. After being in the same area for almost 30 years, we have become somewhat of an “icon” in the community. It was a tough decision to make but we have decided it would be vital to assisting our customers. Our agency has a wealth of knowledge and experience in the property casualty insurance field. We are licensed in Indiana, Kentucky and Ohio. We are members of the Professional Insurance Agents (PIA) and the Cincinnati Insurance Board (CIB). We hope our site will give you the information you need so that we can serve your insurance needs the best we can. 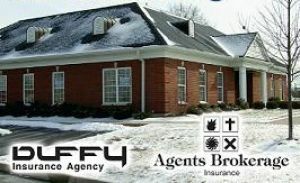 Please contact us with any questions or concerns that you might have at 513-861-5500 or info@duffyagency.com.